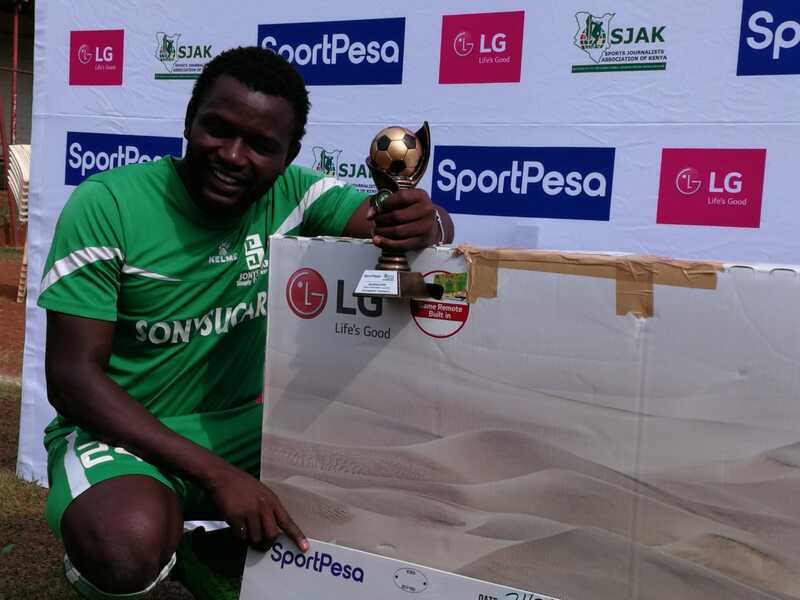 Sony Sugar’s Enock Agwanda “Jowi” has been named the Kenyan Premier League player of the month for July. The burly striker netted two and assisted two goals to pick the top monthly gong against teammate Tobias Omondi and goalkeeper Faruk Shikalo of Bandari. For his efforts, the former Sofapaka, Gor Mahia and Bandari forward, went home Ksh. 100k richer and also won himself a 49’ LG TV and a beautiful trophy. He also earned his teammates Ksh. 50,000 as football is a team sport. Agwanda rejoined his boyhood club midseason after a troubled one or so seasons away with Bandari and National Super League side Ushuru which was dogged with injuries. The second coming has so far been good and he has been at the center of the millers’ spirited fight out of the danger zone. In total, Agwanda has scored seven goals, two more than his personal target when he joined. He thanked his family for the decision to head back to where it all started. “The coach who brought me back here really trusts me and that is a real confidence boost to any player. I didn’t really play as good as I wanted in July but it’s still an improvement from June. I’ve made even more improvements this month and I believe I will be in contention for August honors as well,” he added. Agwanda rejoined Sony Sugar during the June transfer window with the club languishing in relegation zones. His goals have helped the 2006 league champions move to the top half of the table.